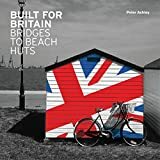 A celebration of some of Britain’s most loved and familiar buildings, Built for Britain revels in structures as diverse as the awe-inspiring Clifton Suspension Bridge over the Avon Gorge in Bristol and a humble row of beach huts on a Norfolk shore. From iconic landmarks to isolated lighthouses, these are often unsung monuments to little-recognised talent and engineering achievement. Many of them are beloved structures in the local landscape, whether it is the Blackpool Tower, Ally Pally, the towering concrete chimneys of the Ratcliffe-on-Soar Power Station in Nottingham-shire, or the captivating spectacle of the Post Office Tower. Continually rearing their outlines or silhouettes up into our collective consciousness, these buildings have in many cases not received the proper attention they so richly deserve. Through their very familiarity and often eye-catching forms, all of these structures, though, are guaranteed to engage and intrigue. Peter Ashley is the author and photographer of Unmitigated England and More from Unmitigated England. He edited Railway Rhymes for the Everyman's Library Pocket Poets Series and collaborated with Philip Wilkinson on books accompanying the BBC Restoration programmes and The English Building Book, the ultimate guide to building types. Index of Architects, engineers, artists and builders.